High quality yet affordable. Our natural looking denture range ticks all the boxes of fit and function, and they will give you something to smile about. This includes strong and durable teeth, with a vast range of shades and moulds, along with the added peace of mind of a 2 year manufactory warranty. 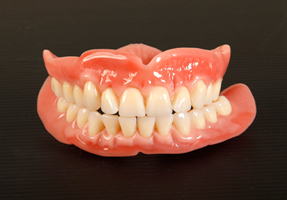 These dentures provide you with a confident natural smile, building on the fundamentals of the natural looking range. The multi-layered acrylic tooth adds more detail to your teeth, with the shade bled throughout the tooth and fine contours. Additionally, the high impact acrylic bases are ideal for patients that have a history of breaking teeth and are looking for a finer finish. These dentures include a manufacturing warranty of 3 years. Our finest range of dentures use the latest technology, materials and philosophy in cosmetic denture construction. The benefit of ivoclars ivobase injection moulding system is unparalleled in providing material toughness, longevity and precision fit for comfort, perfect for cases with high bone loss and mobile gums. The addition of acrylic gum contouring and staining help to achieve a more lifelike appearance. These teeth are gender specific, individualised as well as customised and come with a manufacturing warranty of 4 years.